Extra Cash Loan is a financial institution that specialises in the provision of short term loans. Loans of up to R50 000 are offered. You can apply online from anywhere. You can apply from the comfort of your home, office, or from anywhere you are on-the-go. A credit check will be done, to ensure that you can afford to repay the loan. 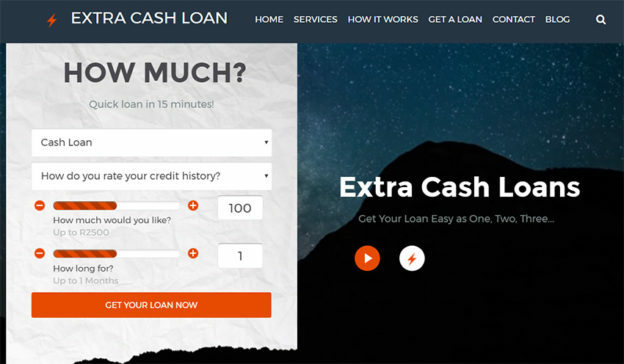 Why choose Extra Cash Loan? Applications are fast and secure and if approved, the money will be in your account within a few hours. Extra Cash Loans has issued over 9700 loans, so you can rest assured that the services provided by the institution are reliable and trustworthy. What are the qualifying criteria? What are the benefits of short term loans? If you have bad credit, taking out a short term loan may help to improve your credit score. By taking out a loan and repaying it over a short period of time, it may help to show potential creditors that you are able to pay your debts off quickly and efficiently. You don’t have the burden of paying a debt off for a long time, as you would with a long term loan. You can pay it off usually within 12 months. You may pay less interest compared to longer duration loans. This differs according to the type of short term loan you get. You can access this loan from various lenders. Many lenders offer short term loans – they are often easily accessible. Getting approved for a short term loan often means that you can get quick access to the money you need. These loans usually don’t require collateral, so there is no risk of losing your property or other valuable assets. Flexibility is offered. Many lenders often give individuals flexible repayment terms designed to make it easy for individuals to afford to make repayments at a comfortable rate. This entry was posted in Personal loans and tagged extra cash loan application, extra cash loan calculator on April 21, 2017 by Elle.